Exhaust Valve Diameter (in) 1.880 in. Guideplate Pushrod Size 3/8 in. Intake Valve Diameter (in) 2.250 in. Maximum Valve Lift (in) 0.700 in. 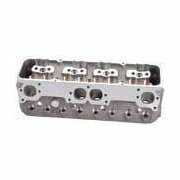 Notes Race-Rite cylinder heads include intake valve stem seals only. Designed for camshafts up to 0.700 in. maximum lift. Outside Diameter of Outer Spring (in) 1.550 in. Rocker Arm Nut Thread Size 7/16-20 in.